In this round-up, we’ve focused on London’s in parks, gardens and other open green spaces. There’s something for everyone: kid-friendly eateries, smart venues, Italian and Indian food, kosher food, social enterprises and community cafés, and gourmet destinations for dressing up and enjoying cocktails, art and music. Unless otherwise stated, the venues are open all year round. However, do phone and check the opening hours if you’re making a special journey: many cafés’ hours are flexible and vary according to the seasons, the weather and how busy the park is. So… take a break from your everyday routine, enjoy a brisk walk in a green space with friends, and then unwind in fresh air surrounded by fragrant flowers and awe-inspiring beauty. While there are plenty of well-known cafes in London's royal parks, finding lesser-known gems in the city centre can prove difficult. Londonist's Ruth Hargreaves suggests this garden square cafe in Lincoln's Inn Fields for a summertime spot off the tourist trail. It still gets busy, mind, especially during the warmer months when nearby office workers flock to find a slice of sunshine. But for the location just a couple of minute's walk from Holborn station, it's as peaceful a spot as you'll find. Bask in one of the cafe's two outdoor terraces with a coffee in hand, or hoover up a wood-fired pizza over a lazy lunchtime. Surrounded by lawns, trees and the gentle thwack of balls from the adjacent tennis courts, it's a central oasis and ideally located for anyone planning a visit to Sir John Soane's Museum right next door. In fact, a portion of all cafe profits are donated to the museum. If the cafe is heaving, there are takeaway options perfect for picnicking. Located near Highgate Village and the famous Highgate Cemetery, Lauderdale House, which faces Highgate Hill, is an elegant, white 16th century building that backs onto Waterlow Park. 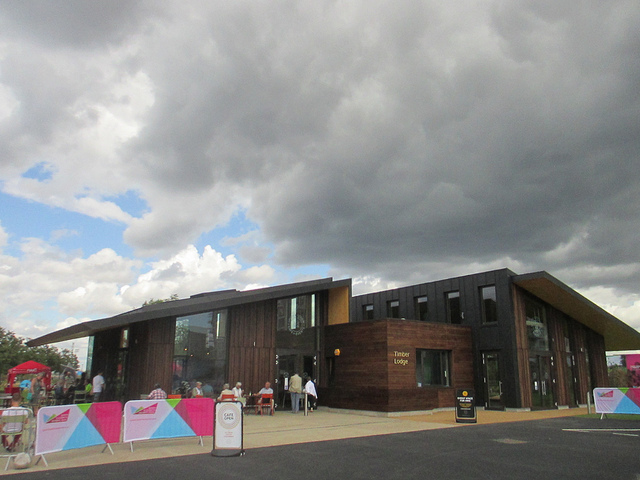 It’s now an arts and education centre that hosts exhibitions, concerts and poetry events throughout the year. Its café is located adjacent to the Lower Gallery with a generous patio, picnic-style seating and a tea-and-cake heavy menu. Very popular with local families, this 12-hectare Victorian park has a café set amid tennis courts, pitch and putt course, ornamental garden, children’s playground with paddling pool and a small zoo. After suddenly closing to much dismay in late 2017, the cafe recently reopened under new ownership and has promised to keep the community feel of the site alive, with just a few menu tweaks. Inside you’ll find sandwiches, soups, hot dishes, cakes, and hot and cold beverages. Its success remains to be seen, but with the previous cafe operational for over 25 years it is undoubtedly a popular location. Frequented by members of the local Jewish community — and open to all — this friendly café claims to be the first kosher park café in the UK. It’s located in the quiet Hendon Park, which has pretty flower borders, tennis courts and a lovely children’s playground. According to the Jewish dietary laws, milk and meat are not mixed, and as this is a ‘milky’ café, there’s no meat on the menu, only fish and vegetarian dishes. You’ll find delicious Israeli specialities, such as Israeli breakfasts, shakshuka (slow-cooked eggs with spicy tomato sauce and toasted pita), and various Israeli platters featuring falafel, hummus, Israeli salad, olives and pickles. Sesame-studded giant toasted Jerusalem bagels come with Mediterranean-style fillings or pizza toppings. Another speciality is freshly made sushi, and staff can make you sushi platters for a picnic. The menu also offers full English vegetarian breakfast, soups, sandwiches, jacket potatoes, pastas, salads, cakes, waffles, crepes, ice creams and desserts. To drink, there are fresh fruit smoothies and milkshakes; plus there’s a separate children’s menu. Big portions of food, and a choice of both indoor and outdoor seating, make this café-with-a-difference a pleasure to visit. Loved by an older crowd of affluent locals and open only April to October, the secluded Chelsea Physic Garden has the hushed, exclusive feel of a little-known secret. We spent several hours admiring its amazing collection of edible plants: everything from olive and cocoa trees to black rice and sumac berries grow here, making it a must-visit for foodies. Situated near trees bulging with little pods of bright green almonds, and attached to the Curator’s House, the charming — and charmingly named — Tangerine Dream Café has lots of tables on the terrace outside. You can also sit on nearby benches, plates on the lap, among the rose bushes, as many do. Regularly changing seasonal menu features ingredients sourced locally, from ‘emerging economies’ abroad, and also from the capital’s top food markets: meat from Smithfield, fish from Billingsgate, and fruit and veg from New Covent Garden. Attractively presented British, Italian and European-style dishes include salads dressed with fruit vinegars, rib-eye steak and pan-fried sea bass. Other enticing items on the menu are West Country spring lamb cutlets with garlic leaf mash and salsa verde; and Ligurian fish stew with saffron-infused potatoes. The café is renowned for its own-made cakes, desserts and lavender scones, and is particularly popular for afternoon tea. Liquid refreshments include wines, beers and their must-try Amalfi lemonade. Note that the garden charges an entrance fee of around a tenner, which you'll have to pay to use the café. Set amid sprawling 13 acres, Fulham Palace was once home to several Anglican bishops. Its 18th and 19th century-style grounds boast rare trees including 450-year old ancient oak, and impressive landscaped and walled gardens. The smart Drawing Room Café, located in the Palace’s former drawing room, overlooks the gardens and offers a seasonal, daily-changing menu of fresh, simple, prettily presented food. Two hot dishes are available daily; plus lunch platters, sandwiches, soups, quiche, cakes, pastries and ice creams. Younger visitors are well catered for with a dedicated children's menu and a selection of colouring sheets up for grabs. Although not located inside a park, Urban Meadow Café is right beside the Bayswater end of the exquisite Kensington Gardens, with views of both the Gardens and nearby Hyde Park. The Modern British brasserie has a bright, airy ‘urban countryside’ look painted with a fetchingly contemporary pattern of leaves, and has a large patio for al fresco feasting. There’s a versatile menu of grazing dishes and more formal meals, along with salads and sandwiches. Start with a breakfast of London sourdough roll with bacon, pork sausage or egg; then move on to something more substantial like roast tomato and stilton linguine, creamy fish pie or confit duck leg. There’s a popular ‘larder plank’ for two to share, comprising smoked salmon, calamari, mozzarella with fig, tempura prawns and sourdough toast. To drink, you'll find a range of beers brewed in London. A grab and go service of food and drink to be enjoyed in the nearby parks is also available. Located inside the majestic Holland Park, this quiet, tranquil café serves freshly made seasonal food that’s sustainable and locally sourced. There’s a basic menu of breakfasts (including kids’ breakfast), sandwiches, paninis, salads, soups and pastries. Also available are tempting freshly baked cakes, such as carrot and walnut, or chocolate and orange marble cake. A list of hot and cold drinks includes freshly squeezed juices. More elaborate hot dishes are served whenever the park hosts operas. The self-service café caters for special diets; and sells food to takeaway, including snack lunch boxes for children. Despite its impressive size of 40 acres, not many Londoners know about Springfield Park by the River Lea, near the Olympic Park. There’s a children’s play area in the centre focusing on traditional ‘natural play’; and the park has won the coveted Green Flag award for being one of the best green spaces in the UK. Inside is the White Lodge Mansion, a Grade II listed building that's home to the Springfield Park Café. Surrounded by lawns and rose bushes, the outside tables give views across Walthamstow Marshes. Inside, the café hosts exhibitions by local artists, live music and other events, and provides free wi-fi, and colouring sheets for kids. There’s an eclectic menu of dishes from around the world, including breakfasts, healthy meze platters, fresh salads, soups, paninis, cakes, pastries and hot meals. There’s a good choice for vegetarians, and freshly squeezed orange juice to drink. The seasonal, regularly changing menu is created from locally sourced, ethically produced ingredients, and the prices are deliberately kept low. Improvements to the park's buildings are currently being undertaken, and due to end by summer 2019. It’s unusual to find food inspired by a top Indian chef in a park café, but this bright, airy and spacious venue in Victoria Park will change your views of both Indian food and the context in which it can be enjoyed. Owned and run by the family of celebrity chef Cyrus Todiwala of the long-established Café Spice Namaste near Aldgate, The Park Café serves up spicy British-Indian breakfasts, snacks and street food. Popular dishes include masala omelette flavoured with red onions, garlic, coriander, green chilli and tomato, served with seven-spiced masala chai; and the intriguing Algerian omelette – a part-baked dish with a crispy chip base, mature cheddar, harissa, coriander, red onions and tomatoes accompanied by cardamom, mint and ginger tea. Along with chicken seekh kebab wraps paired with peri peri-spiced potato wedges, the masala omelette is also available in a tortilla wrap, with Cornish brie and Mr Todiwala-brand date and tamarind chutney. Freshly made sandwiches and kids meals like spaghetti bolognese and fish finger sandwiches are also available. Surrounded by large picnic space, the café — jazzed up with pretty murals and framed pictures — is a sustainable business that sources ingredients from top British producers. Located in the heart of the park near the children’s play area, water pools and skate park, the other noteworthy features here include a striking collection of trees and a model steam boat club. If you’re feeling sporty, there are football pitches, cricket playing facilities, tennis courts, bowling green, and even professional cycling instructors. As the park is historically known as ‘People’s Park’, the café likes to call itself ‘People’s Café’, and keeps the prices wallet-friendly. Timber Lodge is situated in the North Park, near a children’s play area called the Tumbling Bay Playground. (The opposite side, accessible via Westfield shopping centre, is the South Park.) Although the main attractions in the park are the ArcelorMittal Orbit (now boasting the world's longest tunnel slide), Aquatics Centre and Velodrome, there’s also much else to explore, including wildlife meadows, waterways, mountain biking facilities and a large number of picnic spots dotted around everywhere. The café blends into its natural surroundings and creates its own green energy using solar panels. Doubling up as a sleek, modern events space and community centre, it’s a social enterprise that creates jobs for disabled people and keeps the prices as low as possible. In accordance with the government guidelines, food is low in fat, salt and sugar. You’ll find freshly made, seasonal dishes such as Mediterranean salads, hearty soups, healthy breakfasts, weekend brunches, baguette and bagel sandwiches, hot dishes, cakes, desserts, snacks and milkshakes. Enjoy these on the terrace outside with free activity sheets for children, or buy picnic boxes to takeaway. Ingredients are mostly sourced from small local shops and market traders. 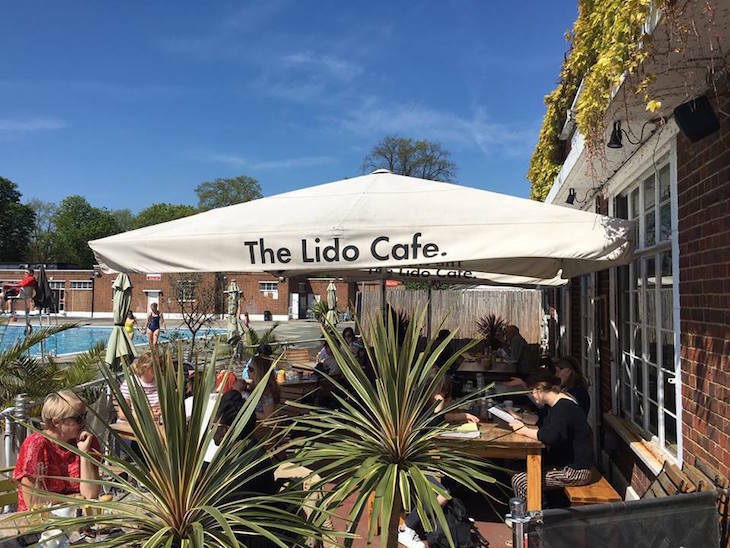 This smart Modern British restaurant is housed in the grounds of the wonderful art deco, Grade II listed Brockwell Lido, tucked away in a corner of the beautiful Brockwell Park. Located between Brixton, Dulwich and Herne Hill, the large park boasts ornamental ponds, formal flowerbeds, ancient walled herbaceous flower garden and a handsome 19th century clock tower. There’s a menu of breakfasts featuring smoked salmon with scrambled eggs, huevos rancheros and homemade granola. Posh beef and veggie burgers are lunchtime favourites alongside ever-changing soups and specials. There’s an all-European wine list, London-brewed craft beers and hot cocktails in winter. Some tables are set aside for walk-ins, otherwise booking is advisable. Located between Vauxhall and Stockwell, the Green Flag award-winning 8½ acre Vauxhall Park is a picturesque oasis with its renowned lavender garden, model village and tennis courts. Located in what was once the park’s public loo, Parco has been rebuilt and refurbished as an Italian café. The small modern venue is furnished with comfy leather sofas and bar stools, with terraces on either side dotted with pretty potted plants in which chillies, rosemary, grape vines and olives grow. The menu encompasses freshly cooked Italian classics like own-made lasagne, veal Milanese, calzone and ciabattas, plus traditional English café fare like sandwiches and soups. There are breakfasts, daily specials, quiches, salads, cakes, pastries, good coffee and Italian ice creams on offer too. The venue is both family-friendly and sophisticated, attracting yummy mummies in the morning, and local office workers and arty types later in the day. This amazing venue challenges the idea of a park café altogether. 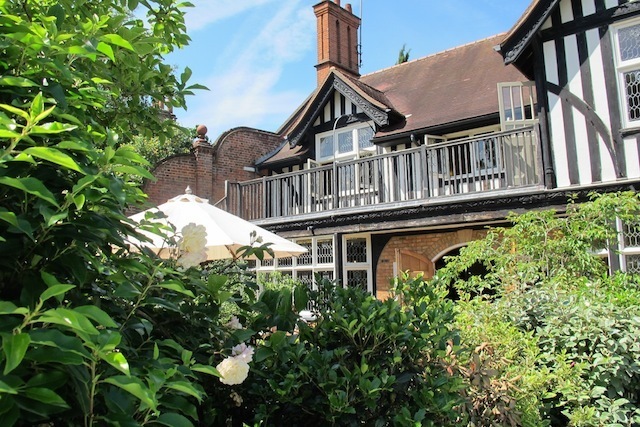 Formerly the Dysart Arms pub, the Dysart Petersham is now an upscale fine dining restaurant. It’s located on the edge of Richmond Park, between the park itself and Petersham Meadows from where it can be accessed by foot. It’s a beautiful arts and crafts building dating back to the early 20th century. The interior has been sympathetically restored and retains many of the original features. Inside you’ll find log fires in winter, crisp linen, sparkling glasses and pottery commissioned locally. In the summer, you’ll want to enjoy full table service in the romantic garden outside, with views over Richmond Park, surrounded by trees lit by twinkling fairy lights at night. There’s even free wi-fi throughout the restaurant and garden. The food here is serious. The contemporary British cooking is rooted in classical traditions. Expect the likes of Creedy Carver duck with coffee, cherry and chocolate sauce on the main menu. Plus there’s a separate vegetarian menu featuring items like poached white beetroot with fermented malt dressing and tortellini filled with goat's curd and black truffle. Carefully sourced seasonal ingredients include wild produce picked by its own forager nearby, and fresh vegetables and herbs from its kitchen garden. The Dysart takes music seriously too, hence monthly classical music recitals from international artists, background music on grand piano, classical guitar and lute, and annual events hosted on behalf of the London Jazz Festival. Regular food and wine matching dinners are also held — and not many park cafés can boast that. 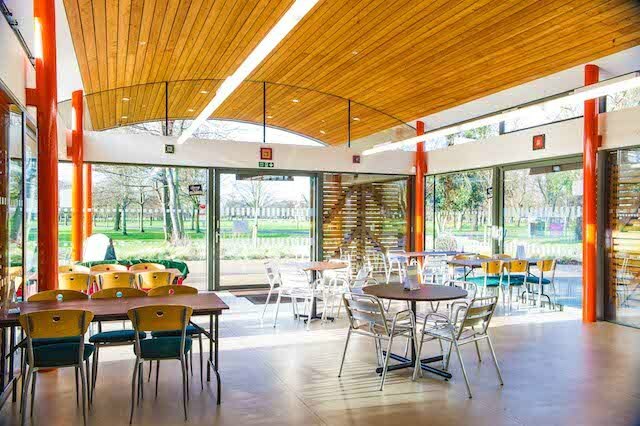 Pistachios in the Park in Greenwich, Brockley, and Lewisham: A commendable franchise of family-friendly, community-minded cafés located in council-owned parks. The Rookery Cafe, Streatham Common: Comforting toasties, baps and soup available daily. Also perfect for a quick cake and a cuppa on your way to the lovely Rookery gardens right next door. The Pheasantry Cafe, Bushy Park in Hampton: Perfect for breakfast, coffee and cake after a morning stroll (they have their own on-site bakery). Does get extremely busy. Hollyhock Cafe, Terrace Gardens in Richmond: Large terrace, dogs allowed, views down over the River Thames. Coffee, cakes, salads and light lunches complete the line-up at this traditional teahouse. 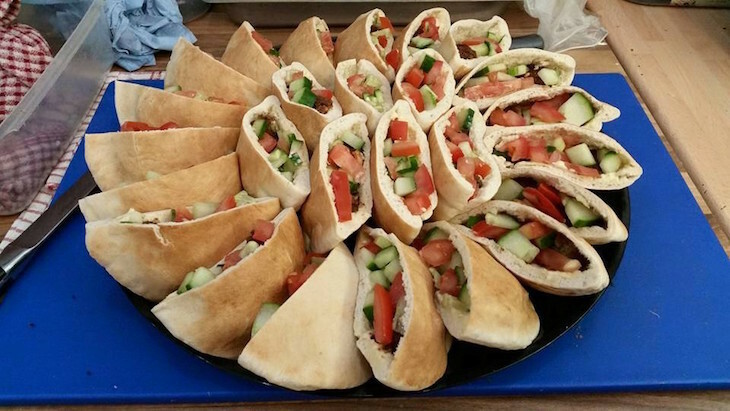 Sunny Hill Cafe, Sunyhill Park in Hendon: A chalet-style family cafe sporting Middle Eastern and Mediterranean dishes. Outside seating pops up on sunny days. Brown and Green Cafe, Mayow Park in Sydenham: Marvellous south London cafe specialising in breakfast and brunch fare. Vegan and gluten friendly options. Another location sits next to Crystal Palace Park. Oxleas Wood Cafe, Shooters Hill: Good value, fuss-free food with panoramic views over the surrounding Kent countryside. Roundwood Park Cafe, Willesden Green: Reopened in April 2018 by a husband-and-wife team with a focus on environmentally-friendly catering and a 'farm-to-table' ethos. Whittington Park Cafe, Holloway: Community-led and extremely family-friendly. Pizzas, cakes and smoothies lead on the menu while toys and books keep the little ones occupied. So, do you know of any other fabulous park cafés that we should include on our list? Ideally somewhere unique or different with great food, smiling staff and a setting of breath-taking beauty? Let us know in the comments section below.